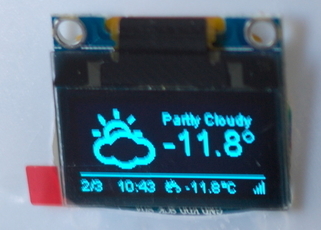 The goal of this project was to display the current weather details on a connected OLED display. There hardest part of this project was getting an OLED library that would work with the Mini D1. The Adafruit library worked just fine, over I2C, on an arduino - but not on the mini-board. Happily I stumbled across this esp8266-oled-ssd1306 library which worked just fine. If connection details have been saved previously the device will connect to the local WiFi network. If no connection-details are saved it will function as an access-point, allowing you to specify the appropriate WiFi network. 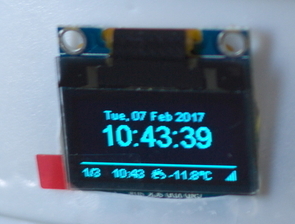 The device will fetch the date & time via NTP. The device will fetch weather-details from Wunderground.com. The current date & time. Over-the-air updates are enabled, to allow reprogramming without disconnection. 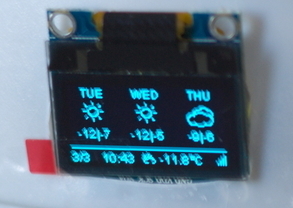 The full code can be found in my ESP8266 repository, in the d1-weather-station sub-directory.